For many, the contents of a bedroom are valuable. This should be taken into consideration when preparing them for storage. It’s likely you have important pieces of furniture that would be expensive to replace should they be damaged from the storage process. To avoid this, to pack accordingly when storing the contents of a bedroom. Mattresses and box springs are extremely important. After all, we use them every day for an extended period of time. Why wouldn’t we take the care to properly place them in a storage unit? Whether they’ll be packed up for a few months, or even a few years, these bedroom essentials should be packed up correctly to ensure their longevity. What you’ll need to focus on when packing a mattress and box spring is keeping the surface of each free of stains and moisture. To keep these things safe, a mattress bag is recommended, which can be purchased from mattress and furniture stores. These protect mattresses and box springs while giving them room to breathe, so mold and mildew won’t grow from trapped moisture. Another thing to consider is the length of time you’ll be storing these things. If you’re planning to store your mattress and box spring for under six months, placing them vertically is fine. For long-term storage, place your box spring and mattress in your unit as they are normally used. If you have large furniture pieces that are easy to disassemble and reassemble, consider taking them apart and storing their components, to create additional space in your unit. Conversely, it can be beneficial to keep pieces, such as a dresser, intact. Use its drawers to hold clothing, decorations, and other knick knacks. For those of us who love reading, our bedrooms may be filled with books. Books are an item that requires special attention when being stored. Refer to our blog How to Safely Store Books in a Storage Unit for some helpful tips on keeping them safe in a unit. 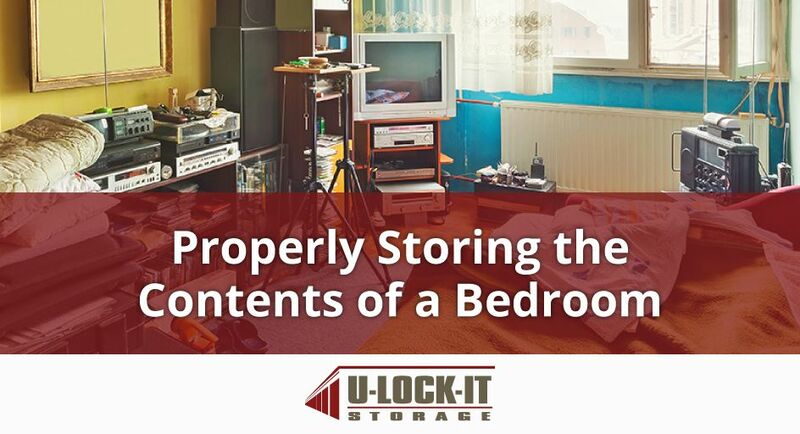 When it comes to the contents of a bedroom, the items are valuable and you’ll want to keep them safe. A climate controlled unit will help to keep your mattress free of moisture, your clothes protected, and your books in the same condition as they were when placed in the unit. If you’re interested in a climate controlled storage unit, contact U-Lock-It Storage in Madison, AL today.